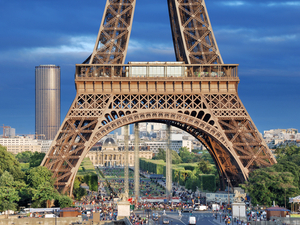 Paris, France's capital, is a major European city and a global center for art, fashion, gastronomy, and culture. Its 19th-century cityscape is crisscrossed by wide boulevards and the River Seine. Beyond such landmarks as the Eiffel Tower and the 12th-century, Gothic Notre Dame Cathedral, the city is known for its cafe culture and designer boutiques along the Rue du Faubourg Saint-Honor. The overall climate throughout the year is mild and moderately wet. Summer days are usually warm and pleasant with average temperatures between 15 and 25C (59 and 77F), and a fair amount of sunshine. Each year, however, there are a few days when the temperature rises above 32C (90F). The best time to visit Paris is from mid-May to mid-September; in particular, from mid-May to late June, when the days are long, nature is in bloom and there is a low risk of excessive heat. However, in this period, but also in mid-summer (July and August), it can rain and it can get cool at night, so it may be useful to bring a sweatshirt or sweater and a light jacket, along with a raincoat or umbrella. Paris is more than 2,000 years old. Paris today maintains its importance, character, and charm, though its appearance is being transformed by structures such as the Beaubourg and by the ambitious projects building program carried out under the presidency of Francois Mitterrand. In addition to the La D'fense Arch and the Bastille Opera, Mitterrand's projects have included the renovation of the Louvre, the La Villette Complex, and the Biblioth'que de France, a great computer-age library. New towns, parks, industrial locations, and expanded functions of existing towns are currently being contemplated for both sides of the Seine. Paris draws visitors worldwide for extended vacations as well as thriving traffic from nearby Le Havre, a large cruise ship port. Whether you are looking for an adventure before or after your cruise, or simply in town exploring, there is something for everyone in the City of Lights. The list of museums, historic sites, monuments, and galleries is very long and extensive. If you choose to create your own journey, make sure you include in your list The Louvre, Notre-Dame de Paris, Arc de Triomphe, Eiffel Tower, Musee d'Orsay, Centre Georges Pompidou, and Tuileries Garden. A trip to Paris would not be complete without indulging in some food or wine. Considered by many to be the gastronomic capital of the world, there are many options for providing your taste buds with the tastiest trip of a lifetime. Take some time and lose yourself in the brilliant history, rich culture, and charm of this magnificent city. Be prepared to see, hear, smell, and taste some of the world's finest life experiences. Bienvenue Paris! Round route in Paris with on/off privileges for 24 or 48 hours! Comfortable double decker open excursion buses! Air-conditioned buses with Wi-Fi and Wheelchair access! Convenient stops throughout the city! Easy to use system map of Paris! Audio narration on the bus - available in 12 languages! A total of 12 Bus stops at the must-see sites along 2 routes! Complimentary walking tour through the City highlights! Coupon book for discounts and other savings at select stores, restaurants, and attractions! The romance, the elegance, the beauty - Paris! Take time out to explore the Parisian lifestyle from up high on the open top buses. You plan your day and see the sights you want. Hop off and explore, then hop back on to your Le Havre Excursion sightseeing bus.